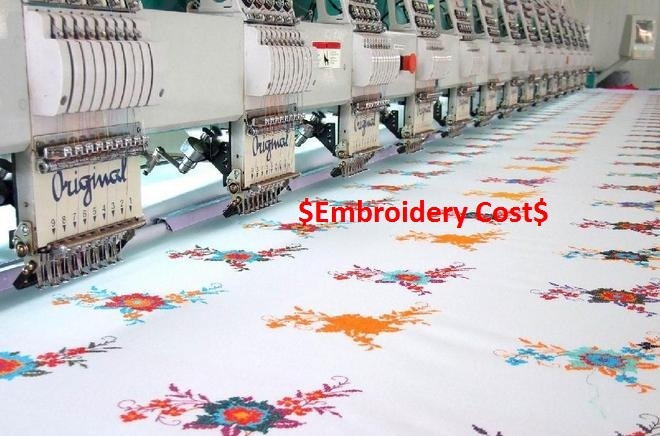 How to Calculate Embroidery Cost in Garments? In this fashionable era, embroidery is a common term in garments manufacturing sector. To make garments more attractive and fashionable, embroidery is must. In my garments merchandising job life I have received rarely without embroidery garments export order. Sometimes it’s seen that, a single garment contains more than two or three embroidery design. During garments costing, garments merchandiser should estimate the embroidery cost also. As its importance in garments merchandising, today I will present here the estimation system of embroidery cost for garments export order. You may follow How to Calculate Knitting Cost in Textile Industry? Normally embroidery costing is estimated on depending embroidery stitch unit, which is 12000. Finally, by using the following formula, garments merchandiser can easily estimate the embroidery cost of garments. Now, one example is enough to clear all the confusion from the above discussion. I need to have new post in my mail. Plz put your mail and subscribe at (Get email updates …it’s Free!) which is situated at the right side o the blog. After that, u will receive all the updates of our blog. I want to know how can measure screen printing cost? please help me.